Mega Sale! Save 29% on the 2mm solid sterling silver 925 Italian round SNAKE CHAIN necklace with lobster claw clasp jewelry fits Pandora charms - inch 32''/80cm by Cozmos Solid Chains at Smart Silver Stacker. MPN: 32inch/81cm_2mm_Snake_Chain3. Hurry! Limited time offer. Offer valid only while supplies last. 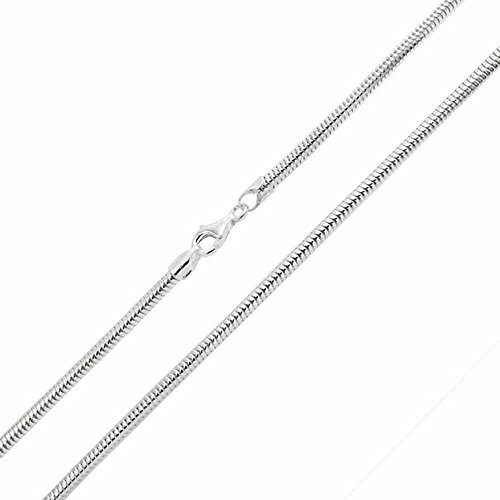 This is a superb quality solid 925 sterling silver chain with a 925 stamp, imported directly from Italy, the chain making capital of the world. If you have any questions about this product by Cozmos Solid Chains, contact us by completing and submitting the form below. If you are looking for a specif part number, please include it with your message.